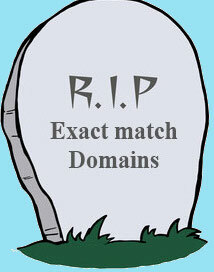 What is Exact-match domain (EMD)? Domains which boost in search results because of there keyword relevent domain name are exact match domains (EMD). In simple words a web address comprising keywords and not the brand or company name is called an EMD. Lets say if your keyword in search is "buy sony laptop" and you have a domain www[.]buysonylaptop[. ]com, then this domain ranks higher because its domain name exactly patch with the keyword. So Google webspam team started considering this as a spam activity and I believe its cirtenly true. Read following paragraph to understand how Google wiped out many small business from there search results. Exact-match domains ( EMD ) algo? A new bomb that the search giant had dropped on white hat webmasters and SEOs on "28th Sep 2012". 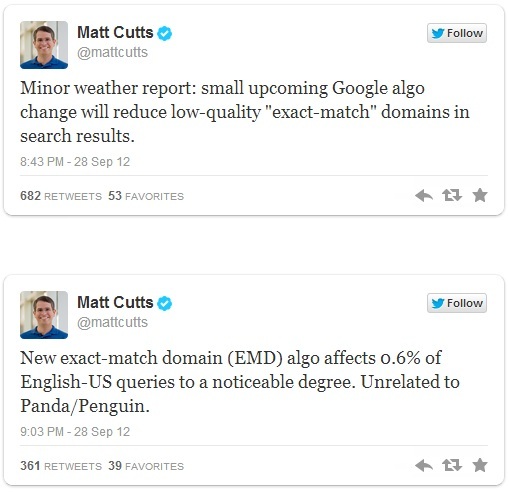 Matt Cutts Head of Google webspam team announced that Google is after exact match domains and this new algo will affect 0.6% of english-US queries. But infact many webmasters are claiming to being hurt by EMD updates. Every SEO forum is flooded with EMD penalty and related stuff. So I guess it's affecting lots of business and webmasters trying to achieve rankings on the exact match domains (EMD). The new algorithm (I call it as bomb for webmasters ), was released by Google on "28th Sep 2012" and this change have dropped lots of EMD rankings, lots of top 10 ranking EMDs slip down. Take a look at the following graph by MozCast to understand the Influence of EMD algo on search results of Google. Domain names Google wants you to buy. Check this video to understand what Matt cutts think about a domain names, this is for you domainers:). Well it's difficult to say anything because he have mentioned the names like facebook, twitter and google in this video. These are big brands and they dont need any kind of keyword relevent domains at all. But it's a must watch video if you are in the process of buying a new domain for your new business as thigs are completely changed now and this video will help you to book a right domain for your business.